It was more than fifty years ago when, while campaigning on behalf of Barry Goldwater in October of 1964, Ronald Reagan asserted that America had arrived at one of those moments in history when the choice before the nation would set out direction for generations to come. He called it “A Time for Choosing,” and parts or all of his speech is still replayed on talk radio shows, and quoted extensively in conservative media. What’s not often mentioned often enough is that American chose incorrectly in that election, and we’ve paid a steep price ever since. I’m no Ronald Reagan, but I contend that we have again arrived at “A Time for Choosing,” although in this case, the choice is not about an election. This time, we’re confronted by something far more terrible. This time, it’s not about our politicians, or even our laws, but instead about us. It may or may not be resolved be elections. It may result in a mass resort to violence. Ladies and gentlemen, we now exist in a period not unlike 1860-61, a nation so thoroughly divided that it may not be held together. The Special Counsel is using his offices and authority to gather and impound all of the evidence against himself and his co-conspirators. Robert Mueller is attempting a new sort of coup d’etat, and if we permit it, we will never see liberty again. Neither will our great-grandchildren. It’s time to choose, and now, you must choose a side. Will you stand for our republic as you have so often pledged, or will you let the feral swine who have corrupted our system continue to run riot on our nation? I, for one, will stand. The Republican Party is a bankrupt institution. They set aside conservative principles long ago in favor of pragmatism and electoral success. They were also morally compromised, and easily gave over to extortion. The Democrat Party is even worse, corroded over long decades by all sorts of communist and socialist radicals who have finally converted their party into the overt manifestation of Bolshevism in the United States. The fact that Robert Francis O’Rourke(D-NY) could come so close to victory in Texas is evidence enough of the dire straits into which our nation has drifted. That a bumbling, moronic dimwit like Alexandria Ocasio-Cortez(D-NY,) perhaps challenging even Houston’s own Shiela Jackson Lee(D-TX) for the title “dumbest person in Congress,” would not be possible but for the fact that America has chosen wrong regularly since Reagan put that choice to her people more than fifty years ago. Our elected officials either seem unaware of what’s happening, or they seem to want what is coming. They exhibit no concern whatever for the future of the country, and no remorse whatever for what they will do to our children. Meanwhile, the vast body of the people stands by silently, letting it happen with little or no opposition. If Bongino is correct, inasmuch as he suggests that justice will not come for the corrupt bastards running the show, our republic is dead. Dead. The trouble is that you will decide that matter. Either you will insist on justice, or your will not. This isn’t about whether you like or hate Donald Trump. It’s not about any of that political claptrap. This is about whether we’re going to have a republic of the sort to which we claim to pledge our allegiance, or instead a sort of banana-republic with a mere facade of “liberty and justice for all.” Is this going to be the Potemkin village of liberty? Were all our war dead sacrificed for that? I want you to think most thoroughly about the meaning of what Bongino has laid out. Just like Bongino, Trump was not my pick in the primaries of 2016. Just like Bongino, I’ve come to admire the fact that for all his myriad flaws, it seems that Donald Trump loves the country, and that he at least fights like Hell. What bothers me most in all Bongino says here is a notion he confirmed in his podcast of Friday, the 30th of November: There will be a deal. His proposition is that this scandal has been so broad and so vast and included large numbers of figures in the Clinton-Obama orbit that there is no way to bring them all simultaneously to justice, and that to attempt it would be to throw the country into anarchy, chaos, and turmoil. His implication is that the Clinton-Obama crew has intentionally fomented a hair-trigger reaction from their political adherents such that we’d have an insurrection of some sort, were all the criminals simultaneously rounded-up. 1.) This is personal. The toll the Clinton crime family, and all those connected to them, have exacted upon the people of this country is large, real, and thorough. I don’t care what the cost may be any longer. 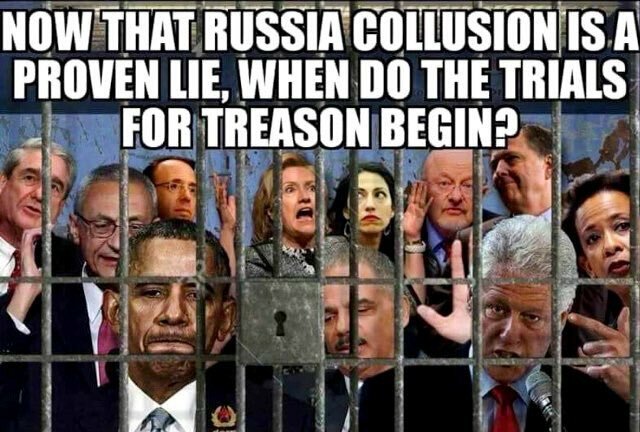 After almost three decades of watching these people make utter wreckage of our nation, it is time they are brought before the bar of justice, and if we must have civil strife to bring them to justice, then let me sign first on the dotted line to be among the instruments that will quell that strife. My life, my fortune, and my sacred honor. All these, whatever token value they may be, I pledge to the preservation of the republic. 2.) This is a matter of Justice. Our US Department of justice has been an incredibly corrupt joke ever since the Clintons began using FBI files to blackmail members of Congress and their staff, members of the bureaucracy, and also members of the judiciary back in the 1990s. The entire US Federal government, including segments of every department, have been hollowed-out and undermined by this stinking, festering rot of corruption, favoritism, and extortion ever since. There can be no restoration of the Department of Justice, never mind justice itself, if any sort of deal is made. These people must all go down, whatever the cost. If we must make a deal with the villains, there can be no justice, and the restoration of our Republic will remain out of reach, foiled this time by those who ought to have been its champions. 3.) It is said that the American people will not be able to process it all if such were to happen in one fell swoop. I disagree. I believe people of good nature and good faith have lost their trust in the righteous nature of the most of the American people. Perhaps too long in and amongst the villains, some seem too willing to accept the villains’ assessments of the American people. It’s as if they believe we “can’t handle the whole truth.” I assure you, this is a faulty notion and belief. If the President and his cabinet and other relatively clean leaders in DC and around the country go forth to tell the American people the whole truth, the American people will hear it, but those who do not and who will not are likely of the same corrupted class as the villains. To Mr. Bongino, I would say that the idea that it would be too much for the American republic to survive is to underestimate the heart of what is the republic. At no other time in history has the republic been more ripe for such a revival. Our young people don’t believe in America’s greatness, we are told. If those who had known better will now shrink from justice because it might incite a brief but calamitous fight, is their cynicism not justified? Wouldn’t it be to surrender and thereby prove the purveyors of their anti-American indoctrination correct? Burn them all, and let us rebuild the Republic in sight of their ash-heap. If you’re an American, or if you’re a British subject, or if you’re a citizen of a European country now subsumed into the catastrophe called the European Union, you should know that your nations are in the process of being stolen from you. There is not a single government among them that is eligible to remain, and every one of those governments is infected with the virus of treason. The United States, of the most central interest to this blog, is now in the throes of its present death, not by some armed foreign invader, but by an infectious agent deposited among our alleged “elite” political establishment. These people are a disease unto themselves. They have sold their country out to the world’s thugs, and the time has come to pay up. Donald Trump was elected president under the rules of our constitution, but he will not be permitted to exercise that office in any but the most superficial way. Every long-time visitor to this blog knows I had been no particular fan of Donald Trump, the man, or Donald Trump, the candidate. Quite to the contrary, I have been very critical of many of his positions and pronouncements, and I doubt very seriously that this is likely to change. One of my most thoroughgoing criticisms of Donald Trump has been(and remains) that he exhibits no particular devotion to any specific, or self-consistent body of principles. That criticism and all of the lesser complaints that fall out of it are easy enough to understand, but what may cause some confusion is what I will say next: If we are to save this republic, if that is our actual goal, we must preserve and rescue the presidency of Donald J. Trump, warts and all, even from itself, lest we lose our nation forever. This seems a rather obnoxious claim, and on its surface, I would generally dismiss such claims as radical hyperbole. Let me attempt to support that claim, or reference others who have done a masterful job in so doing. Let me begin by making the following assertion: Donald Trump was elected President of the United States through a process during which he took no steps that would ordinarily be considered illegal or even quite unfair under the political system in operation since our founding. In fact, it might well be said truthfully that Donald Trump had managed to overwhelm a system that had been unfairly rigged against him. Does anybody seriously wish to contend that the outcome of the 2016 primary season had been reduced to another Bush-Clinton showdown until Donald Trump came down that escalator in June 2015? Do you know who are the Never-Trumpers still in existence at this late date? They are the people furious with Donald Trump for interrupting this precise outcome. “By what right?” “He’s not even really a Republican!” You can hear their shrill contempt still echoing in establishment media, and through the halls of Congress. If in the primaries of 2016, you voted for Donald Trump, you put your finger in the eye of this establishment. I must here note that I did not vote for Donald Trump in the primary in 2016. Let me also confess that had I known two years ago all I have learned since, I would have done so enthusiastically. It is not that I believe Donald Trump is a great president, or that my opinion of Donald Trump as an unprincipled man has changed, but that I now see the true enemy more clearly than ever I had seen it before. The real enemy is far more frightening than Donald Trump could ever be, because Donald Trump does not hate this country. Our real enemy is out to destroy the USA, and is well along that path. Donald Trump is the final possible obstruction. Will Donald Trump save the republic? I don’t know. I only know that his will likely be the last opportunity to do so in our lifetimes, and perhaps ever. The entire “Russian Collusion” narrative was cooked up to confound and demolish the Trump presidency. I want you to know that any sophist who approaches you with another argument about it is either a knowing participant in the treasonous conspiracy, not merely against Trump, but against our republic, or is a willing political tool of those conspirators, believing themselves to be on the same “team.” Think of the latter(and more numerous) group as our contemporary version of Stalin’s “useful idiots.” This includes the more innocent “NeverTrumpers” out and about in the conservative movement, who believe their principled opposition to Trump ought now lead them to participate in the “resistance.” These must come to understand the truth: Trump is the duly elected President, and all efforts to interfere with his authority as such are born of the real collusion between the two parties’ DC establishments in an ongoing treason against the whole body of the American people, and the republic to which they were born. There are a great many people attempting to chronicle the truth about what is going on, but I think if I had to credit one person in media for making it more understandable and aggregating all the bits of this monstrous situation into a single, cogent narrative, I would have to credit Dan Bongino. Bongino has a daily podcast, and since episode 628, he’s done more to put this story together in one coherent story that the average person can easily understand, without appealing to a single “conspiracy theory.” In fact, everything Bongino has put together is backed up by public news reports, in much the same way Mark Levin had done a little more than thirteen months ago, when he made the public accusation that FISA warrants had been used by actors within the Obama administration to conduct surveillance on the Trump campaign and administration under color of law. For his part in bringing this to light, and for his continuing efforts to expose this, we mustn’t forget that Mark Levin has done more to lay the groundwork than any other person in media. If you want to know who is orchestrating the theft of your country, you’d better learn these names and the deeds associated with them. Bongino has been unmasking this plot against the American people since episode 628 of his daily podcast, back on January 8th of 2018. It just happened to be the case that I first stumbled into Bongino’s podcast for the first time on the very next day, and it happened to be part 2 of that same story. If you want to save the Republic, let me tell you how that can be accomplished at this very late date: Robert Mueller must be fired. Rod Rosenstein must be fired. The Republicans threatening to impeach President Trump should he fire Robert Mueller must be exposed. They are part of the plot. They are the Republican co-conspirators who are participants in stealing your country. There are more than these vocal Republicans, a list that includes scum like my own Senator, John Cornyn, and others like Lindsey Graham. Trump must fire Mueller now, and he must assemble a team empowered to take down the conspirators. You will be shocked by the breadth and depth of the conspiracy, but you must know it all if you are going to rescue your nation. Robert Mueller must be fired to have any chance to save this republic. The whole DC Uni-Party knows it. What remains is for you to recognize it, rise up in indignant rejection of it, and to reclaim your country. Whether you’re a fan of Donald Trump, or perhaps instead held your nose and voted for him rather than see the epic criminal shrew win instead, or even if you didn’t vote for him at all, unwilling to “hold your nose,” it’s time to recognize that he is the president, and he is now the only person of significant governmental power standing between our Republic and the abyss. Act accordingly. Editor’s Note: On a more personal note, I realize now that many of you had hoped my previous string of posts signaled my re-emergence. Obviously, that wasn’t the case, but I do believe that day will come before this year elapses. Between health concerns, the various burdens of my personal and professional life, it will be some time yet. It just so happens to be the case that occasionally, a story or bit of information comes to light that I believe must not be missed, and this is one such story. I remain fiercely committed to our constitution and the form of government it had established, but the ugly truth of what has been done must be widely known if we are to defend and preserve it. Forces much more violently aggressive to our liberties are afoot, and they are striking back at us now for the impertinence of electing an unapproved President. These self-anointed “elites” are nothing more than modern-day brigands hijacking a nation, or a whole collection of them. Even now, the rats, having eaten numerous holes in the hull of our ship of state, are fleeing our capital in an orderly fashion to prevent a panic or questions. These are the conspirators who now believe too much has leaked, and too much is out in the light for them to evade criminal culpability if they remain in Washington DC. The ones who remain are on the hook, and there’s no way out of it for them, so they are staying to fight this all the way to the bitter end, whichever way it goes. They have nothing to lose, but everything to gain, including avoiding the noose. Yes, this conspiracy is as serious as that, and it’s why Obama and his circle of conspirators remain in Washington DC: Should all this be revealed to any substantial degree, they’re all going to prison at the very least. This is why we must insist that President Trump fire Robert Mueller. Mueller is the key to this operation, and this is why people like Trey Gowdy are not to be trusted. Ever.